A monocular is usually a relatively low magnification optic, designed for use in the daytime. It differs from a telescope in that it is intended to be hand-held. Macroscopes are a subset of monoculars that have close-range capability, allowing it to double for a hand lens or magnifying glass in the field. As such, the Minox MS 8x25 Minoscope is fairly typical of this genre, though it has a lot of properties that render it atypical in some very appealing ways. 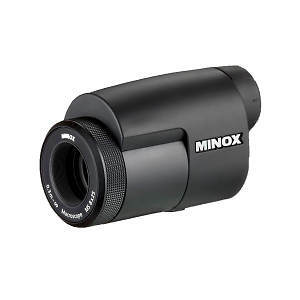 The Minox Macroscope is incredibly compact, just 4 inches long with the eyecup fully extended, by 2 inches tall and 1.75 inches wide – this is truly a pocket telescope! The device weighs 150 g, or about 5.4 oz., so it’s not going to rip out your pocket either. The device is covered in black rubber armoring with black anodized aluminum accents (the black and silver version is no longer available from Minox) and sits comfortably in the palm of one hand, to allow focusing with the other hand. Which brings up a small but important point about this device: as tiny as it is, this is still a two-handed optic, unless you have availed yourself of the tripod mounting hole on the bottom of the ocular tube. This hole will fit the standard screw-mount for most tripods and monopods. While we’re on the subject of focusing, focus on the Minoscope is adjusted with the knurled aluminum ring on the end of the objective lens. The focus goes from minimum close focus to infinity in just 0.75 turns of this ring, which is a very steep mechanism. In a binocular, this would be almost a problem since it would be an unforgiving mechanism, but in a monocular, where speed of focus is at a premium in the field on anything that is mobile, it’s actually a plus. The Minox literature lists the minimum close focus capability of the Minoscope at 30 cm (~12 inches) and we found this to be accurate. Moreover, the image is very sharp indeed. With this device, you can get closer to a butterfly than it’s likely to let you get! The unique aspect of the focus mechanism is worth some attention. The Minox Minoscope is actually a porro prism device, yet it is fully sealed and purged with argon (supposedly better than nitrogen-purging because it is chemically inert), so it is completely waterproof, dust proof and internally fog proof. You can even submerge the Minoscope to a depth of 5 meters without it losing its seal. Normal porro prism devices cannot be sealed in this way because they would leak around their conventional focus mechanism, but Minox found a way around this. 8x25 12 mm 342 ft/1000 yds 12 in yes 5.4 oz. 2.0" x 1.75"
The device has 8x magnification, and a 25-mm objective lens. We were frankly surprised by how bright the image is for an objective lens of such modest dimension. In part, this is because Minox has used very high-grade materials for the lenses and prism elements, excellent multi-coatings (they used the same M*coating found on their premiere line of HG binoculars), and in part because porro prisms have some intrinsic advantages over roof prisms in terms of light transmission. In any case, this is a very bright little optic. In other properties, the Minoscope has a 342-foot field of view at 1000 yards, which actually competes favorably with most binoculars of 32-mm or smaller objective lens size. The device has 12 mm of eye relief, which is a bit short for most eyeglass wearers. Accordingly, the twist-up eyecup does not come out too far, but it is adequate to the amount of eye relief inherent in the monocular. The Minoscope has a few features and peripherals that are worth noting. The optic comes in a small, brushed-leather, drawstring pouch that has a metal grommet built in for attaching to a small aluminum carabiner that Minox provides, which allows it to be carried from a belt loop. Alternatively, on the ocular end of the device, there’s a recessed bracket for mounting to the thin cordura neck strap that comes with it. Additionally, the device is protected by a 5-year manufacturer’s warranty. Due to its small size and light weight, the Minoscope is very versatile and works well in many activities that don’t involve nature watching. We’ve used it to good effect at symphony concerts and sporting events. All that leaves just one question we’ve yet to address, which is how much is one of these cute little babies going to set you back? The Minox Minoscope sells for $255.00. At that kind of price, there may be quite a few people who want to drop one of these in their pocket. We give the Minoscope an enthusiastic thumbs up! Buy the Black Minoscope 8x25.